Barcelona have confirmed that they have signed Mali midfielder Seydou Keita on a four-year deal from their Spanish rivals Sevilla. "Seydou Keita signed a contract committing him to Barcelona for the next four seasons, or until June 20, 2012," Barcelona said in a statement. The club has not revealed the transfer fee, but Spanish news reports said it was around US$22 million. "I am very happy because Barcelona is a great club," he told the Barcelona website. "My decision is a big one because I had proposals from a lot of clubs, but I have liked Barcelona for a long time. "It has all been very easy as I wanted to play for Barcelona, so the most difficult was the agreement between Sevilla and Barcelona. "When this was resolved, everything was done." 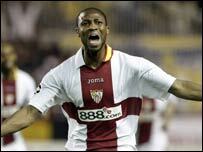 Keita enjoyed an impressive first season in Spain after arriving from Lens nearly a year ago. Acting as a midfield lynchpin, he also scored several spectacular long-range goals. The midfielder previously played for Marseille and Lorient, with which he won the French Cup. He was voted the best player in the Under-20 World Cup in Nigeria in 1999. "I don't like talking because I think in soccer you don't need to talk off the field," he added. "All I want to say is that I hope to contribute a lot to Barcelona just as I have done to Sevilla." The 28-year-old is expected to replace Portugal's Deco, who has announced he wants to leave the Nou Camp. Keita would be Barcelona's first new signing since it announced this month the replacement of coach Frank Rijkaard by reserve team coach Pep Guardiola in a reaction to its second straight season without a trophy. Barcelona finished third in the league - its worst placing for five years - and were knocked out in the Champions League semi-finals by eventual winner Manchester United.